New Coat Painting Professionals (Painting Contractors) is a company to sort out all your damp proofing needs. Damp and mould growth in your home looks and smells un pleasant and can increase the risk of respiratory illness. There are many different types of damp, below or some of the most common and can be treated to stop any further problems. Penetrating damp occurs generally if there is a crack in the structure. This type of damp is generally easy to resolve. 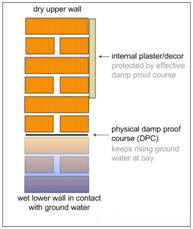 Rising damp occurs when there is a break down in the damp proof course (DPC) this type of damp is generally easy to resolve. Signs of the above damps could be slight straining on wall paint starting to bubble or mould developing. If you re paint the wall you or only hiding the damp for a period of time then the damp will worse. 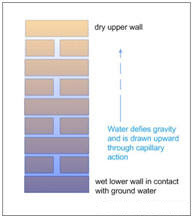 Once the damp proof course has been compromised remedial action is required as soon as possible, continued presence of dampness on the upper walls will lead to deterioration of brickwork and internal plaster, décor. The internal plasterwork in the home can break down quickly when exposed to such dampness. Replacement of plaster is usually required to some degree. This generally involves removal of the existing salt contaminated plaster* and render, applying a new sand & cement render with the appropriate waterproofing additive and then skimming with the appropriate finish plaster. *Salt contaminated plaster should not be left in place, it will continue to absorb moisture created in the home and will frustrate attempts to correct the wall décor. Damp patches to external walls as shown may exhibit significant moss/lichen growth on external brickwork, water staining etc. Dampness may also be felt and seen on internal walls of the property, black mould due to resultant condensation, moisture and salt bands are all common tell-tale signs to look for. 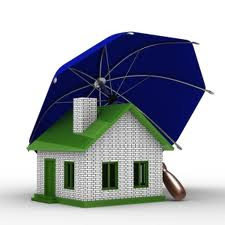 All these conditions may of course not be due to rising damp, they could be the result of a simple water leak due to poor guttering, roofing etc. 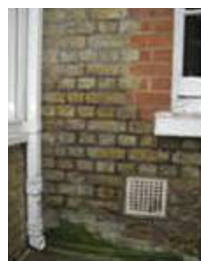 which results from the property suffering from penetrating damp a subject also covered on this site. A professional remedial survey is highly recommended in such cases as mistakes in diagnosis are commonplace, errors can result in unnecessary and costly works that fail to control the dampness.New Coat Painting Professionals (Painting Contractors) provides free surveys and reports, with impartial, honest advice on the options available to the customer. Injection of a chemical damp proof course one course above the DPC. Removal and replacement of internal plastering, including any preparatory/finishing works with regard to skirting board, radiator removal replacement. The scale and scope of necessary remedial work can be determined with a full remedial damp survey, the extent of actions will be contained to works that are absolutely necessary and will generally not extend to a property wide exercise.